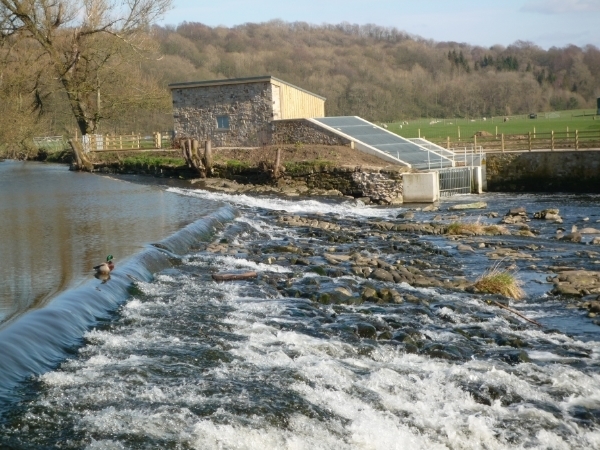 This 100kW micro hydroelectric generating plant on the south side of the River Calder at Whalley, Lancashire for green renewable energy (see map) began generating in November 2014. Electricity generated is being supplied to the national grid. Income will be used to improve energy security locally by investing in renewables and reducing carbon emissions through a Community Benefit Fund. The scheme is based on a variable speed Archimedean screw. The Calder is a ‘high base flow’ river low down the catchment area (average annual rainfall across the area is 1100-1300mm) which provides a dependable supply of water. It uses a weir which has been in place for 700 years. It grew out of Transition Town Clitheroe which has the broad objectives of developing greater community resilience to cope with reduced future availability of fossil fuels and adapting to climate change. The yellow dots are the cumulative monthly targets to achieve the predicted annual output of 345MWh in the average rainfall year. The theoretical output (blue line) is based on data from the Environment Agency’s gauging station downstream by the abbey. Those data are used to calculate river flows which are then checked against the designer’s figures to find the expected power output. Hover the cursor over a line to see the exact data that was used for the data point. The first tab shows output since the start of generation in November 2014. The second tab shows output for the current year. The third tab shows the raw data. All are updated frequently. In the first few weeks of generation actual export was below theoretical output while settings were being adjusted. We have to keep output below 100kW so the initial settings were conservative. As the settings were adjusted output improved. During the summer and early autumn of 2015 river levels were lower and output consequently was below winter levels. September and early October rainfall was below average in the NW of England and actual output fell below what would be expected for the 20 year average. The flat red line in December 2015 was the result of the Boxing Day flood. This highest ever river level put the plant out of action for 12 days. Spaans Babcock Ltd of Heywood Lancashire were appointed by Whalley Community Hydro to do the pre-feasibility study and subsequently consulting and design of the project. This early working partnership culminated in Spaans Babcock providing a complete turnkey solution including overall project management for all aspects of the site including Civil, Mechanical and Electrical engineering, adding to their portfolio of existing sites.